Home » Offbeat » iPhone App to track Parking Officers! Of all the crazy/useful iPhone apps this app seems to be one really useful one. The developer was inspired to develop this app after he was constantly hampered with parking tickets costing him over 1000’s of dollars per year. This Australian man developed an iPhone app that will let users warn each other when parking officers are spotted lurking near their cars. 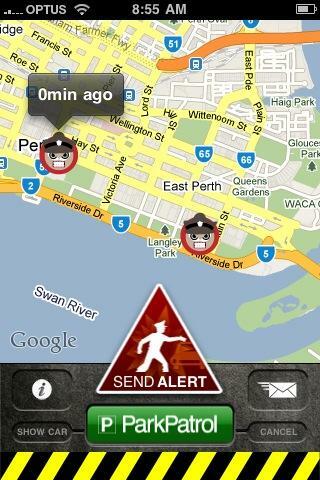 ParkPatrol in action, a screenshot of the App. “The idea was pretty much born out of frustration,” said Joseph Darling of “ParkPatrol,” the app developed by his Sydney-based firm to help users avoid tickets that cost what he said was at least $82 Australian ($81) a shot — and often more. The final straw came when he was ticketed in his own neighborhood despite a parking permit that he pays hundreds of dollars for each year. The app is community based. When users sign in, they can report sightings of a parking officers. This is marked in the map which is represented by a cartoon face wearing a cap, along with the a note thanking the who updated it. The app will also alert users if a parking officer is spotted in their area and how close. Notification options for 500 meters (1,640 ft), 200 meters and 100 meters are available. The free app is available in English, German, Spanish, Portuguese and French. Roughly 80 percent of users are in Australia, but it is also used in England, Spain, France and Germany, Darling said. “With an active community, it’s pretty accurate. We reckon around 90 percent,” he added. Future versions, currently being finished, will include an alert function for when parking time has expired. The company is also finalizing an Android version.